For the year that's in it I thought that a few more photos of the marrowbone distillery could be added. 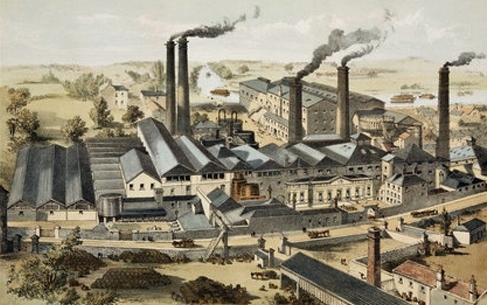 The first is an engraving showing the distillery prior to the addition of the building on the opposite side of Marrowbone Lane ,but with the smaller building on the opposite side of Forbes lane and the connecting Bridge /covered walkway. 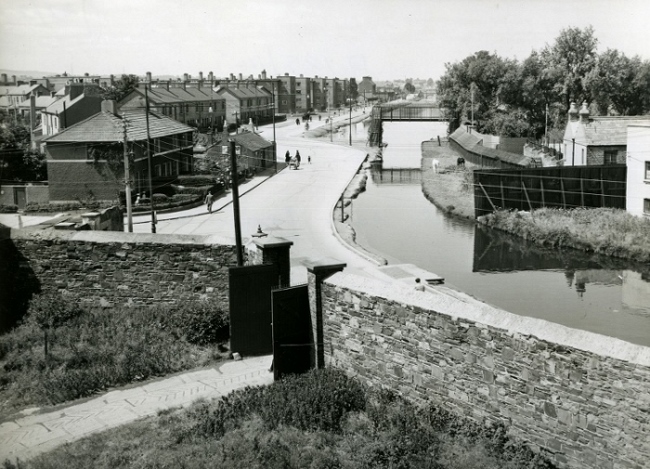 The second photo is taken from the distillery and shows the rear gate exiting onto the canal side ( St. James Walk). The "metlar" or Cage bridge spanning the canal can be seen at the point that the canal narrows. This gate still exists and with a small portion of wall and an arch is all that remains of the distillery on the canal side. Photo courtesy Bureau of Military Archives. 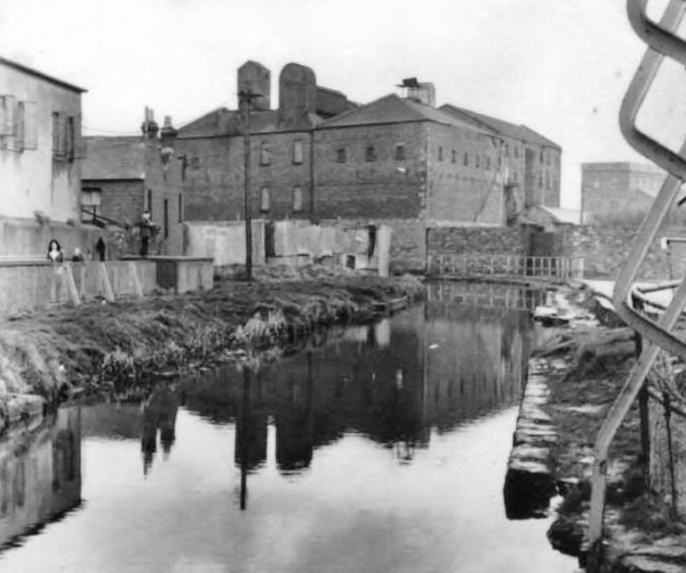 This photo is of the remains of the distillery from the Rialto bridge side of the canal showing the large building fronting the canal and Forbes lane. The large distillery extension on the opposite side of Marrowbone lane is also visible. Last edited by charleymcguffin on Sun May 08, 2016 9:27 pm, edited 1 time in total. 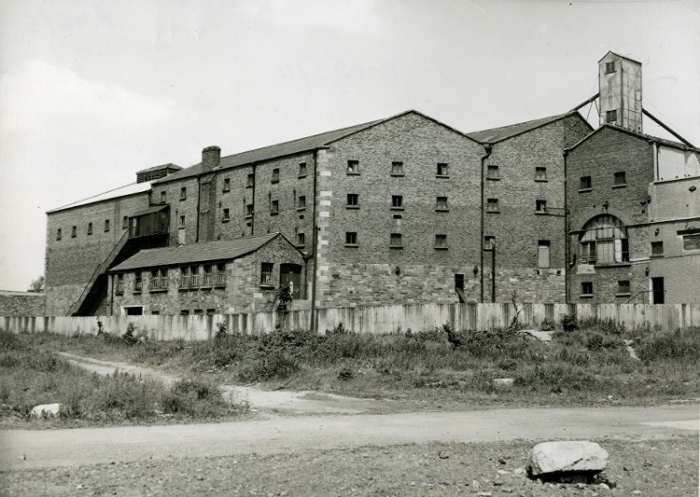 This photo shows the remains of the distillery as they were in the early 1950's Check against the original engraving . These are the building from which the majority of the action in 1916 took place as they commanded the view of the canal ,Marrowbone lane ,Pim street and Forbes Lane. This photo is from the distillery ,looking down the canal toward the harbour.The curved harbour buildinng is visible as is the Guinness Malt house top right. The spire of St.James R.C. church is visible over one of the harbour buildings as is the truncated spire of St.James Cof I church ,now Alltech distillery ,just left of centre. Looking down Pim Street from the distillery, Guinness building at end of street ,the car has just passed over the swing bridge of the canal extension to side of Guinness building. 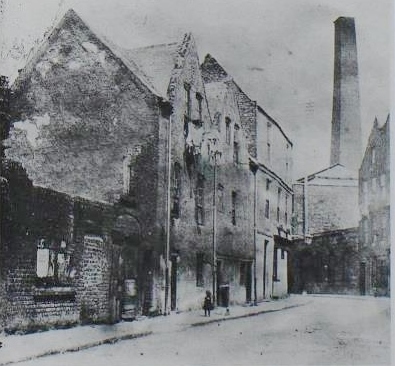 The buildings on the right were the remains of the distillery buildings on the other side of Forbes lane that were connected to the main buildings by enclosed walkway. ( Keith's Mineral water company may have occupied these buildings during the 1920's) There was a cooperage business here for many years. 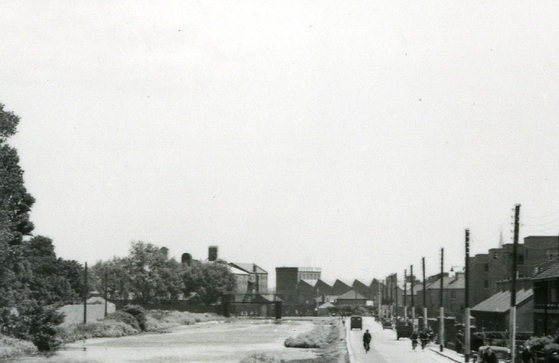 This very old photo is of Marrowbone Lane looking at the curve in road as it meets Forbes lane with one of the distillery chimneys dominating the skyline. Marrowbone Lane to Forbes Lane. This photo shows that most of the buildings on the Marrowbone lane side have been leveled. This is taken in the direction of Cork ST. The building on opposite side of the lane still exists. 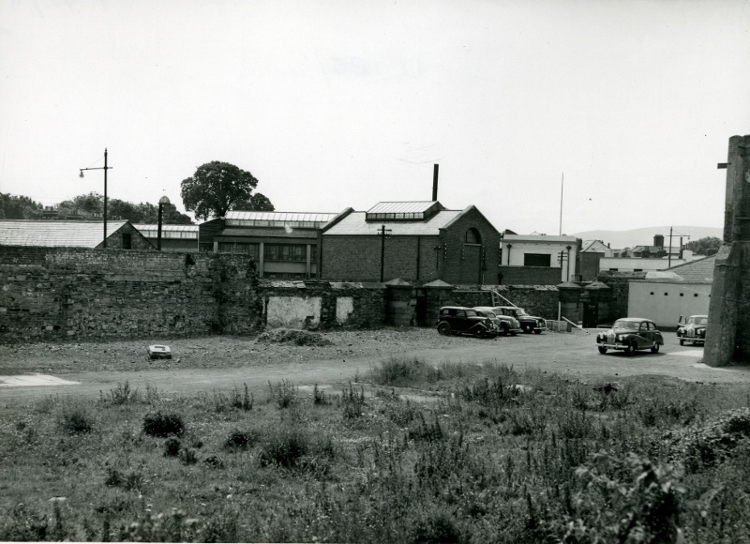 This photo shows the extension to the distillery on the opposite side of Marrowbone lane to the main distillery. It was connected by walkway/bridge and the outline of where the walkway had been ,can be seen in the brickwork .This building was sold to W.D & H.O. 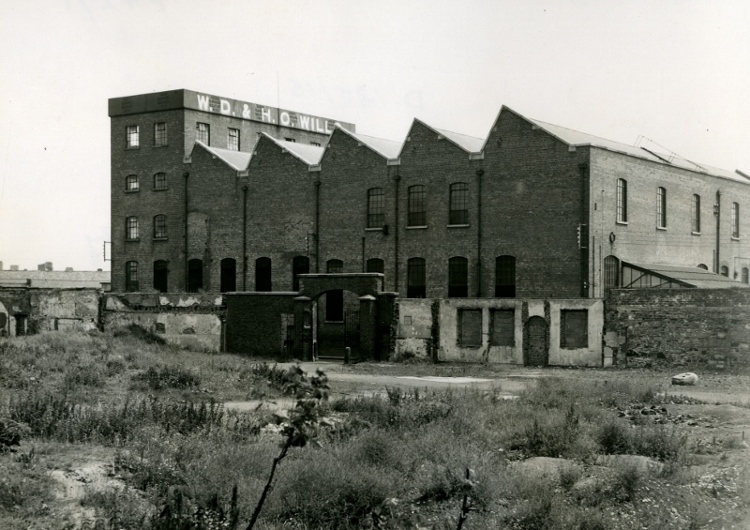 Wills in 1923 by the Dublin Distillers Co. Lt. and was their headquarters for many years until they moved to the south circular road. 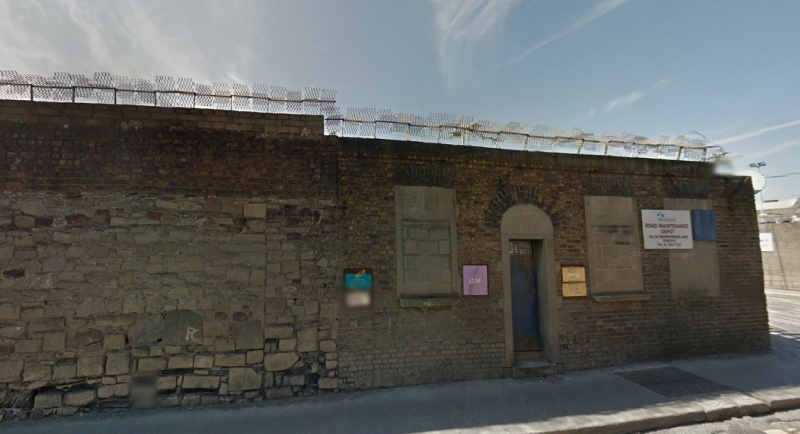 To me the most important piece is the section of building to the right of the gate .it is the remaining facade of the old office building fronting Marrowbone lane and played an important roll in monitoring the daily activities of the distillery and was crucial to the garrison of 1916. Although the gate has disappeared the office facade still exists although not given recognition of its importance . It is covered in defacing signage and in a poor state. A plaque commemoration the 1916 garrison was recently unveiled on the canal side stump of wall . I can only surmise that it was placed where it was ,because the most obvious place to put it was would be too much of an embarrassment. I will come back to this later. A photo from " an T-oglach" Dec 1924 ,showing the gate of the distillery , the section of the site that is now W.D. & H.O. Wills and an outline of the walkway connecting the two sections of the distillery. 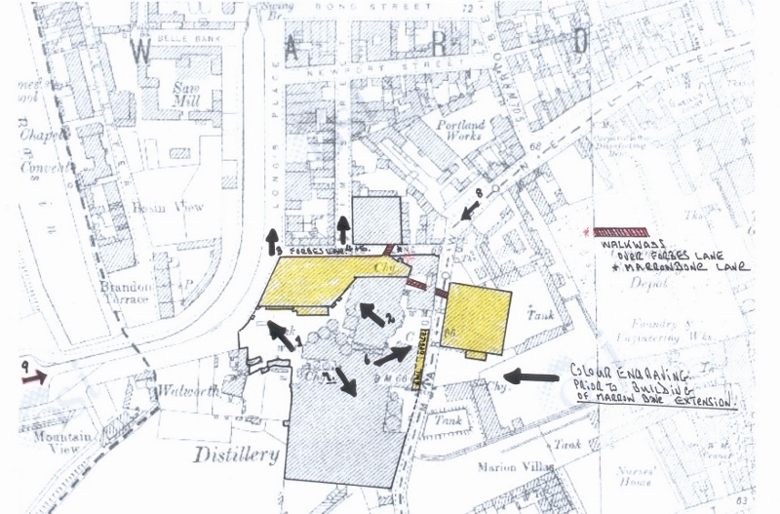 Map showing the remaining sections of the distillery ,when photographed and camera positions. walkways connecting the different sections in red. A slightly fanciful and not quite Accurate drawing of the area from "The Illustrated London News " of 1846. Here we can see the canal , City Basin and the harbour all now filled in with the Luas running on its bed. 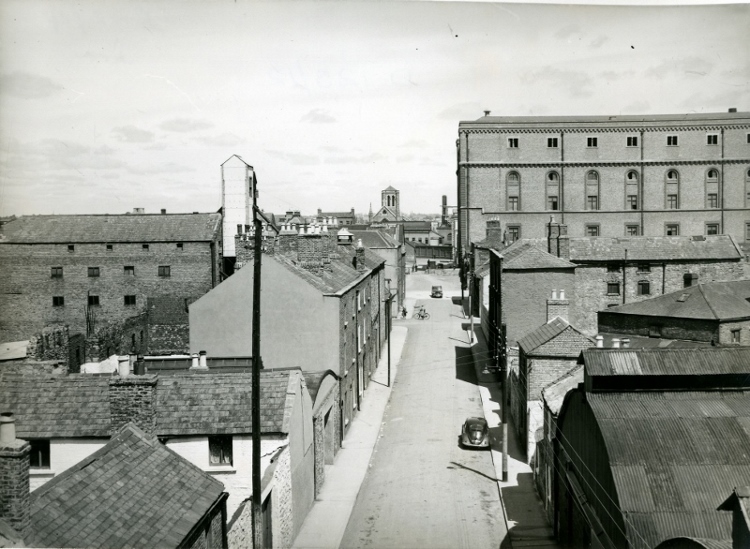 The old workhouse is to the left , now replaced by St.James hospital .The George Roe distillery windmill is in the top right of the picture sans sails.Royal Hospital Kilmainham in the top of picture . The old St. James church is visible behind a row of houses to left of the Roe windmill. This was rebuilt into its present form(Alltech) in 1859. 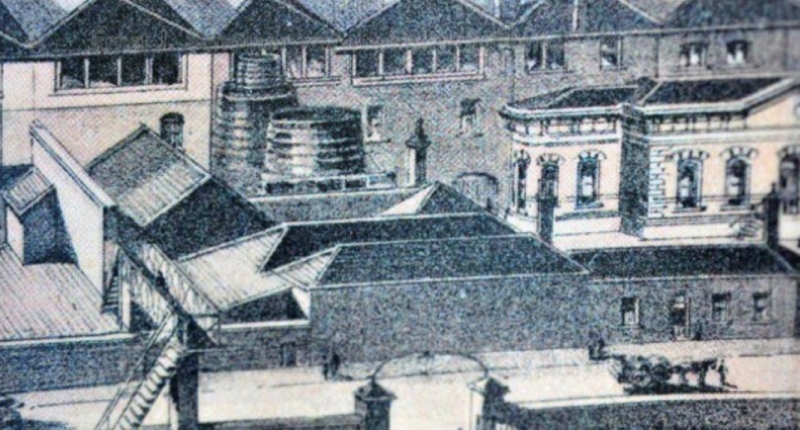 Missing from the drawing is ,the curved canal harbour building which was built in 1863 and of course the large Guinness buildings ,the malthouse built in 1885 and the storehouse built in 1902. The distillery chimneys are evident at the curve of the canal. Just to finish . 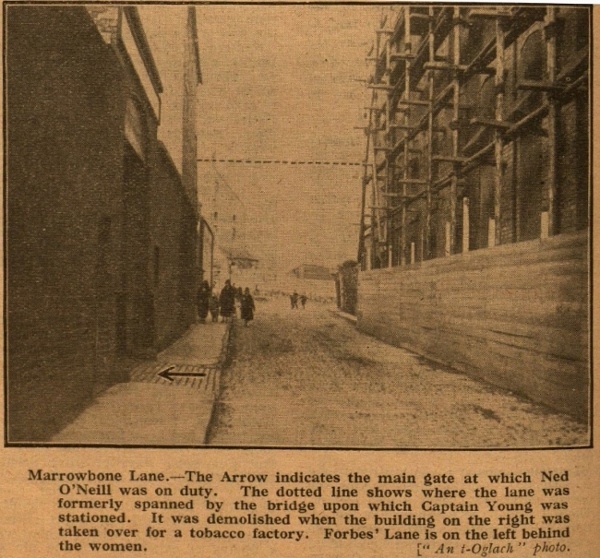 Whenever The Marrow bone lane distillery is referred to it is usually illustrated by the remains of the walls on Forbes lane. To my mind the most important remains are ignored . This as I implied in previous post is the facade of the office that flanked the main entrance gate on Marrowbone Lane . It is still there albeit covered in very poor signage which destroys the look and with badly bricked up windows. The first photo is an enlarged piece of the old engraving of the distillery showing the office..
Third photo is a simple cleaning up of the inappropriate signage and a rendering applied to the window openings to make them a little more presentable. In the working life of the distillery this little office would have overseen the comings and goings of the distillery and its importance during the 1916 rising is apparent from the testimonies of the men and women who served there. 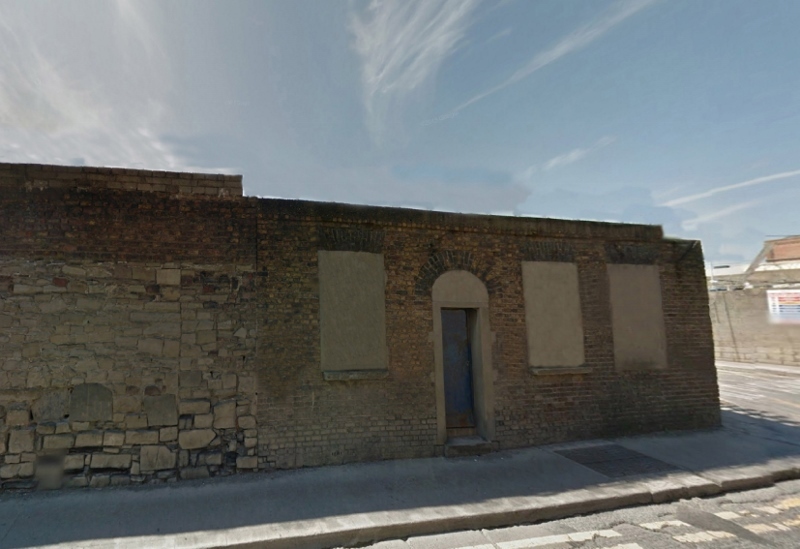 I am writing to the heritage section of Dublin City Council ,in an attempt to get them to acknowledge the importance of the remaining facade and to have it cleaned up of its inappropriate add-ons. Ideally the plaque now on the small section of wall in front of the modern telephone exchange would find a better home here and perhaps interpretive panels could be affixed to the window spaces. Not just luck, but many thanks. Another photo of Marrowbone lane . This time looking up the canal from the harbour.Forbes Lane to the left after the row of houses. The arch which still remains can be made out mid building. 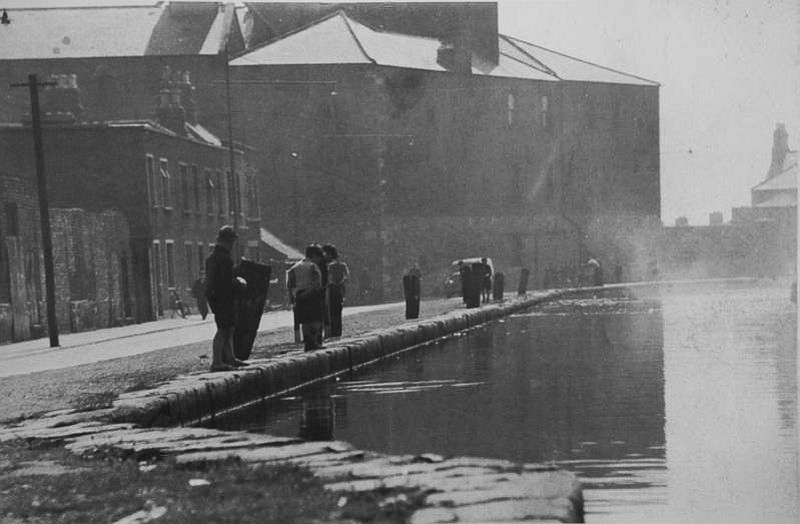 Marrowbone lane distillery on canal bend looking from harbour. 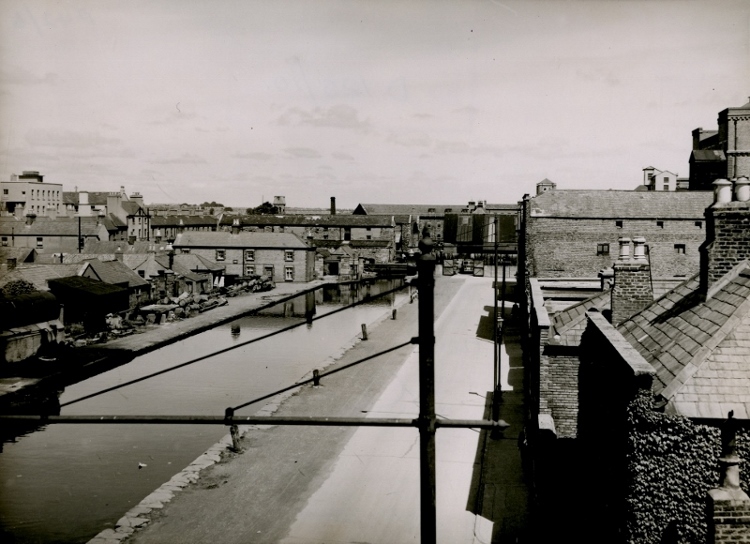 Another photo from late 1940's or early 50's showing the barley stores of Marrowbone lane from the cage bridge looking to the curve of the canal .The extension on the other side of Marrowbone Lane is visible as is the gate to canal side in the first set of photos.